Many students with strong mathematical skills who possess only an undergraduate degree have difficulty finding a career that makes good use of their skills. The Computational Mathematics program at Duquesne University introduces students to various real-world applications of mathematics, trains students in computational techniques, and grounds them in statistical methods. Many employers and graduate programs in applied mathematics and statistics find this interdisciplinary mix of three key STEM (science, technology, engineering, and mathematics) skills very appealing. Pittsburgh is a regional hub in areas including finance, healthcare, transportation, and sports. All of these fields need employees with the types of knowledge and skills that graduates of Duquesne's Computational Mathematics program possess. A few of the better-known Pittsburgh-area employers who have hired Computational Mathematics students and graduates for internships or as full-time employees include Bayer, BNY Mellon, FedEx Ground, Management Sciences Associates, the Pittsburgh Pirates, and PNC. Pittsburgh is also an education hub. Duquesne's proximity to other major educational institutions benefits the research of some of our faculty members, which in turn informs their work with students in the Computational Mathematics program. In addition, several of our graduates have found it convenient to stay in Pittsburgh as they have gone on to earn a Ph.D. in applied mathematics or statistics at Carnegie Mellon or the University of Pittsburgh. A key element of the Computational Mathematics M.S. program at Duquesne - and one that few if any other similar programs have - is the requirement that graduates be knowledgeable in three distinct disciplines: applied mathematics, computer science, and statistics. As noted above, this interdisciplinary mix has been highly attractive to employers. Unlike some M.S. programs that are small parts of large Ph.D. - granting departments, Duquesne's Computational Mathematics class sizes are small and faculty members are accessible. On the other hand, unlike some programs at smaller institutions, a number of our Computational Mathematics faculty members have active research programs that enliven their courses and provide opportunities for student participation. Students also have access to key software packages that span the program's disciplines, including SAS, R, JMP, SPSS, Maple, MATLAB, and Visual Studio. 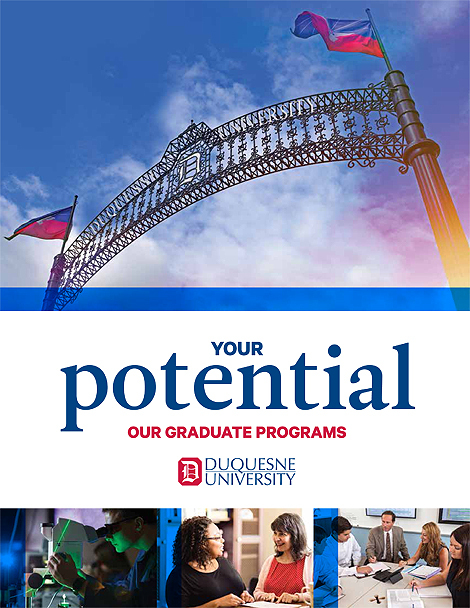 Another Duquesne advantage is that the program is designed with full-time employees in mind. All core courses and the bulk of the elective offerings are offered at times of day when full-time employees can typically attend. Yet another Duquesne distinctive is our membership in a local consortium that allows our students to cross-register for courses at other nearby educational institutions, including Carnegie Mellon and the University of Pittsburgh. This provides a wide range of potential electives to our Computational Mathematics students. Many of our graduates enjoy careers in data analytics, employing their mathematical, statistical, and computational training in order to draw reasoned conclusions from large and complex data sets. A number of other students have utilized the Computational Mathematics program as preparation for earning a Ph.D. in applied mathematics or statistics and are now employed at educational institutions including the Albert Einstein College of Medicine, Clemson University, and California University of Pennsylvania. Other graduates have found that their M.S. degree has been sufficient to obtain full-time employment in universities, teaching undergraduate courses or supporting research programs. Other potential career paths include analytical support roles in scientific and engineering environments, transportation planning, and logistics.